We present a method that describes isolation and culture of cochlear explants from embryonic mouse inner ear. We also demonstrate a method for gene transfer into cochlear explants via square-wave electroporation. The in vitro explant culture coupled with gene transfer technique enables researchers to study the effects of altering gene expression during development. Haque, K. D., Pandey, A. K., Kelley, M. W., Puligilla, C. Culture of Embryonic Mouse Cochlear Explants and Gene Transfer by Electroporation. J. Vis. Exp. (95), e52260, doi:10.3791/52260 (2015). Auditory hair cells located within the mouse organ of Corti detect and transmit sound information to the central nervous system. The mechanosensory hair cells are aligned in one row of inner hair cells and three rows of outer hair cells that extend along the basal to apical axis of the cochlea. The explant culture technique described here provides an efficient method to isolate and maintain cochlear explants from the embryonic mouse inner ear. Also, the morphology and molecular characteristics of sensory hair cells and nonsensory supporting cells within the cochlear explant cultures resemble those observed in vivo and can be studied within its intrinsic cellular environment. The cochlear explants can serve as important experimental tools for the identification and characterization of molecular and genetic pathways that are involved in cellular specification and patterning. Although transgenic mouse models provide an effective approach for gene expression studies, a considerable number of mouse mutants die during embryonic development thereby hindering the analysis and interpretation of developmental phenotypes. The organ of Corti from mutant mice that die before birth can be cultured so that their in vitro development and responses to different factors can be analyzed. Additionally, we describe a technique for electroporating embryonic cochlear explants ex vivo which can be used to downregulate or overexpress specific gene(s) and analyze their potential endogenous function and test whether specific gene product is necessary or sufficient in a given context to influence mammalian cochlear development1-8. The mammalian organ of Corti is comprised of a mosaic of specialized cell types, including two types of mechanosensory hair cells as well as at least four types of nonsensory supporting cells making it an ideal model system to study normal cellular processes like proliferation, fate specification, differentiation and patterning. In addition, the normal development of these different cell types is essential for normal hearing function. Hence, it is crucial to understand the factors, both molecular and cellular, that regulate their development. However, the small size of the mouse cochlea as well as its inaccessibility poses a particular challenge for gene expression studies. Moreover, most of the cell fate specification and patterning events occur during embryonic time periods and are mostly completed before birth. Therefore, identification and characterization of signaling events during embryonic time periods is essential to gain insight into the molecular basis of cochlear morphogenesis. Here, we demonstrate a method to culture intact cochlea in vitro from embryonic mouse inner ears. The rationale behind the use of this technique is that cultured cochleae maintain their molecular and morphological characteristics thereby providing a valuable model for investigating potential candidate genes and exploring the mechanisms involved in cochlear morphogenesis. Although transgenic mice can be used for gene expression studies, an in vitro system is often needed for monitoring specific gene functions. Moreover, cochlear cultures can be established from transgenic mouse embryos so that their in vitro development and response to various soluble factors and antagonists can be studied. Although embryos at day 13 (E13) are used in this protocol, cultures from E12 or E14 to early postnatal inner ears can give similar results. We also present a gene transfer technique in cultured embryonic cochlear explants using square wave electroporation. Following the isolation of the cochlear explants, electroporation can be used to express DNA plasmids of gene(s) of interest in individual cells within the cochlear duct. This technique serves as a complementary approach to studies utilizing transgenic mice to gain insight into the molecular pathways underlying cellular phenotype. Using this method of gene transfer, a variety of epithelial cell types within the embryonic cochlea are transfected, thereby enabling loss-and gain-of-function analyses at the single-cell level. In addition, electrophysiological studies can also be performed in cochlear explant cultures8. This method of in vitro electroporation is relatively simple and straightforward, combined with minimal damage to the tissue, has resulted in a rapid expansion of this technique. NOTE: All protocols using live animals must be reviewed and approved by an Institutional Animal Care and Use Committee (IACUC) and must follow officially approved methods for the care and use of the laboratory animals. All the dissections should be performed using sterile technique on a clean laminar flow bench. Gloves and a mask, if desired, should be worn during this procedure. Sterilize the laminar flow tissue culture hood by turning on UV light for about 30 min and disinfect the surface with 70% ethanol prior to use. In addition, sterilize all dissection instruments including fine dissection tools and Sylgard-coated dishes for embryo dissection via autoclave or by soaking in 70% ethanol for at least 20 min before use. Pour off 70% ethanol and allow the dishes and instruments to air dry in a clean laminar flow clean bench prior to use. Prepare sterile Hank’s Balanced Salt Solution (HBSS)/(4-(2-hydroxyethyl)-1-piperazineethanesulfonic acid) (HEPES) mixture by adding 10% of 10x HBSS and 0.5% HEPES and adjust the pH to approximately 7.2 and filter sterilize the final solution and store at 4 °C. Carry out all dissections in chilled HBSS/HEPES solution to better preserve the tissue throughout the procedure. Coat glass bottom dishes with basement membrane matrix by adding 5 ml of cold (4 °C) sterile Dulbecco’s Modified Eagle Medium (DMEM) to a 300 µl aliquot of basement membrane matrix in a sterile 15 ml polypropylene tube. Mix by vortexing the contents and add 150 µl of the basement membrane matrix-DMEM mixture to the center of each culture dish so that it covers the entire culture well present in the center of the dish. Cover the dishes and store in a 37 °C incubator for at least 45 min before use. Pour 4-5 ml chilled HBSS into three sterile polystyrene petri dishes and leave closed in the hood. Prepare culture medium in a sterile 15 ml polypropylene tube by adding 9 ml of DMEM, 100 µl of N2 supplements, 10 g/ml Cipro and 1 ml of FBS. NOTE: In this procedure for culturing cochlear explants from embryonic mice, harvest inner ears from embryonic day (E) 13 temporal bones with the day after fertilization being considered as E19. The protocol can also be used with embryonic mouse inner ears beginning from E12 to E18. Euthanize a timed-pregnant mouse with CO2 and sacrifice animal by cervical dislocation or appropriate approved protocols. Carry out euthanization away from laminar-flow tissue culture hood to maintain sterility in the tissue culture room. Place euthanized mouse on paper towel with abdomen facing up and disinfect abdomen with 70% ethanol. Open the abdominal cavity by grabbing skin with curved forceps with one hand and cut epidermis and muscle along the midline with scissors using another hand. Make two perpendicular cuts on both sides and pull out the uterus carefully by lifting up bilateral uterine horns with forceps and detach it from underneath connective tissue using scissors. Place the embryonic chain in a petri dish containing chilled dissection solution (HBSS/HEPES mixture) and transfer to the laminar-flow clean bench. Remove embryos carefully from placenta and place them into one of the sterile Petri dishes containing dissection solution. If the solution turns bloody, move them to a new Petri dish. NOTE: At this point, embryos can be staged using a Theiler staging guide. Decapitate embryos by pinching at the neck region with a pair of clean forceps or scissors and place the heads in a fresh Petri dish containing chilled dissection solution. solution. 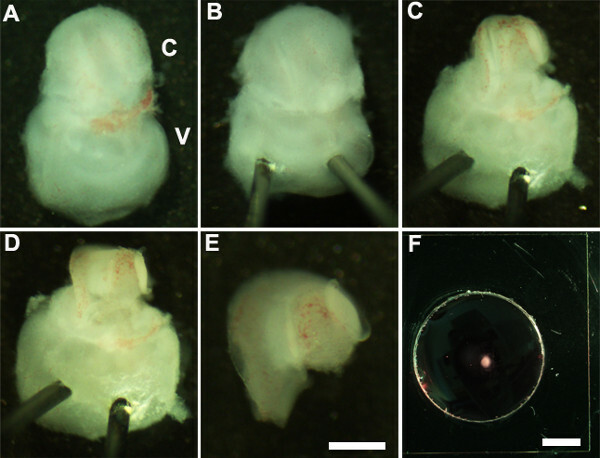 Working under a dissecting microscope at a magnification of ~1.6X, immobilize the embryo head by placing Minutien pins around or closer to eye region (Figure 1A). Using two pairs of sterile forceps carefully remove the skin and open up the skull on the dorsal side along the midline (Figure 1B). Remove brain from cranial cavity and inner ears located within temporal bones can be identified at this stage (Figure 1C, D). The lining of the blood vessel, which is usually present around the inner ears, can be used as a landmark for identifying the inner ear at this stage (Figure 1D). Dissect the inner ear from the temporal bones by placing the forceps underneath the tissue and isolating the inner ear from base of the skull and transfer to a new dish containing cold dissecting solution (Figure 1E, F). NOTE: At this stage of development, the tissue is cartilaginous and can be easily dissected using forceps. Orient the inner ear so that ventral side is facing up (Figure 2A) and stabilize the inner ear by gently inserting the sharp end of Minutien pins through the vestibular portion of the inner ear (Figure 2B). Using ultrafine forceps cut open the overlying cartilage by making an incision using one end of forceps near the oval window and carefully remove the cartilage from the cochlea (Figure 2C). NOTE: It is important to make sure that forceps are not inserted too deeply into the cartilage as overlying cartilage is sometimes fused with the cochlear duct in which case it is helpful to use closed forceps to release cartilage from the underlying cochlear duct by scraping below the surface of the cartilage. At this stage of development, the cochlear spiral is only three quarters of a turn in length. Next, expose the sensory epithelium by placing the forceps at the preferred region of the cochlear duct, either the base or at the very apex, and gently pulling out the roof of the cochlea (Figure 2D). NOTE: The roof of the cochlea must be removed completely as it can mask the sensory epithelium hindering the analysis. NOTE: This procedure must be done gently as it is easy to tear the sensory epithelium. As a last step, carefully remove the underlying connective tissue from the exposed sensory epithelium so that the base of the cochlear explant is uniformly flat. Isolate the dissected cochlea from the vestibular portion of the inner ear using forceps. This can be performed before or after step 2.4 (Figure 2E). Transfer the dissected cochlear sensory epithelium into a basement membrane matrix-coated culture well using a 1.5 mm sterile scooper (Figure 2F). Orient the cochlear explant with the lumenal surface of the epithelium facing up and aspirate the basement membrane matrix-DMEM solution to carefully flatten the tissue and replace it with 150 µl of fresh culture medium by gently adding to the dish. Care should be taken to make sure that each explant adheres well to the coated glass coverslip and is not floating in the culture medium. Ensure that the tip of the forceps is pointed up while affixing to the glass well to avoid damaging the cochlear explant. Gently transfer the culture dish into a sterile 150 mm culture dish and place in a tissue culture incubator at 37 °C with 5% CO2 for desired period of time, usually 3-6 days in vitro (DIV). After 1 DIV, examine the cultures under a dissecting microscope to make sure that the cochlear explant has adhered well to the culture dish. After incubation in vitro for desired lengths of time, cultures are processed for immunohistochemistry. NOTE: The explant cultures usually are incubated for 6 DIV which is equivalent to developmental stage, P0. After incubation in vitro, cultures can be processed for further downstream applications like immunohistochemistry (Figure 3B), RT-PCR, in situ hybridization, and/or western blot. Sterilize one 100 mm Sylgard-coated glass dish by autoclaving or soaking in 70% ethanol for about 20 min and allow to air dry in a clean bench prior to use. Prepare DNA from an expression vector of choice using appropriate maxi- or midi-prep kits. The expression vectors used in this protocol are pIRES2-Atoh1.EGFP and pCLIG-NeuroD1.EGFP. The final concentration of DNA should be at least 1 µg/µl in sterile DNA/RNAse-free water. Add 10 µl of plasmid DNA solution to a fresh 100 mm Sylgard coated dish and transfer a fully dissected cochlear explant (obtained from step 2.5) into the DNA solution. With lumenal surface of the epithelium facing up, tilt the cochlea slightly so that it’s perpendicular to the plane of the dish. Place the electrode paddles on either side of the cochlea with negative paddle (cathode) towards the sensory epithelium and the positive paddle (anode) located adjacent to the base of the cochlea. NOTE: Since DNA is negatively charged, it migrates from negative to positive electrode and by placing the cathode end of the probe adjacent to the sensory epithelium; the DNA will mostly go through the surface of the sensory epithelium. Using electroporator, deliver 9 to 10 pulses of 24 mV, 30 msec pulse duration with the foot pedal switch on the electroporator, and then add 100 µl of warm culture medium to the electroporated cochlea. Repeat steps 3.2.1-4 for all the cochlear explants and for DNA of all genes of interest and transfer the electroporated cochleae into the basement membrane matrix-coated dish for plating (step 2.7). Culture all the electroporated cochleae in a 37 °C, 5% CO2 humidified incubator for desired lengths of time which will then be processed for immunocytochemistry. NOTE: The cochlea from an entire litter of CD1 mouse (approximately 8-12 pups) can be isolated, microdissected, electroporated and plated in <4 hr. NOTE: The cultures are usually incubated for 6 DIV which is equivalent to developmental stage, P0. After incubation in vitro, the cultures are fixed and processed for immunocytochemistry. After desired length of incubation, remove culture medium and quickly rinse the cochlear explant in phosphate-buffered saline (PBS) and incubate in 4% paraformaldehyde (prepared in PBS) for 15 min at room temperature. Wash the fixative by adding PBS and rinse in PBS three times for 15 min. Permeabilize using PBS-T (PBS + 0.5% Tween) for 30 min before blocking with PBS-T containing 10% goat serum. Incubate in primary antibody solution containing primary antibody in PBS-T with 1% goat serum overnight at 4 °C. Wash the cochlea three times at room temperature using PBS-T 15 min each before adding appropriate Alexa-conjugated secondary antibodies. Since the cochlear explant is cultured on glass coverslip it can be handled individually by isolating the coverslip from the dish and mounting on a slide. This can be achieved by soaking the culture dish in OS30 solvent for at least 1 hr at room temperature. Using the sterile razor blade, detach the coverslip from the dish and mount on a slide and visualize under a fluorescent microscope. We describe a method to isolate cochlea from embryonic inner ears and micro-dissect to expose the sensory epithelium. Once dissected, it may be plated and cultured as an intact cochlear duct (Figure 3) and analyzed by immunohistochemistry. The cultured cochlear explants provide a useful assay to examine the effect of variety of soluble factors and pharmacological drugs on cochlear development. Following dissection of cochlear explants, electroporation technique can be used to misexpress genes of interest and examine their effect on cochlear morphogenesis. The results presented here demonstrate that forced expression of basic helix-loop-helix (bHLH) transcription factor, Atoh1 into cultured cochlear explants established from E13 inner ears leads to ectopic hair cell formation. In contrast, forced expression of another bHLH transcription factor, NeuroD1 in prosensory cells and nonsensory epithelial cells within GER leads to the formation of ectopic neurons. Figure 1: Dissection of the embryonic cochlea. Dissection steps involved in isolating developing cochleae from E13 mouse head as discussed in Part 1. Dotted line in (A) indicates dorsal midline and the borders of inner ears are indicated by arrows in (D). In (E), C indicates cochlea and V, vestibule. Scale bar: 1.0 mm. Figure 2: Generation of embryonic cochlear explant cultures. Panels (A-F) illustrate key steps in the dissection of the cochlea down to the sensory epithelium as described in Part 2. C, cochlea; V, vestibule. Scale bar: A-E, 100 m; F, 10 mm. Figure 3: The development of the organ of Corti in cochlear cultures. The formation of hair cells and supporting cells occurs normally in cultured explants. 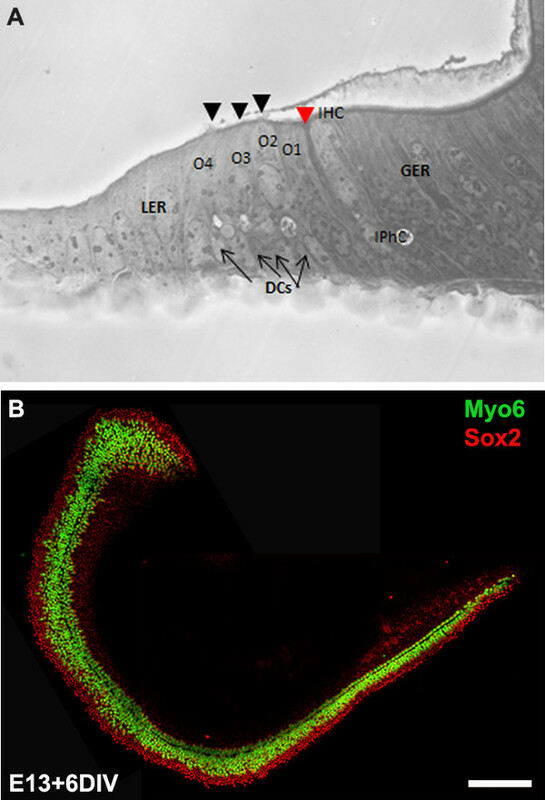 Cross-sectional view of E13 cochlear explant incubated for 6 DIV (equivalent to P0) (B) and top-down view of a whole-mount cochlear explant immuno-stained with Myo7a in green and Sox2 in red demonstrates the presence of one inner and 3-4 rows of outer hair cells and surrounding support cells. Arrows point to Deiters’ cells and black arrowheads indicate the presence of stereociliary bundles within the cochlear explant. Arrowhead in red indicates the depression formed by the prominent pillar cell projection. IHC, inner hair cell; O1,2,3, three outer hair cells, DCs, Deiters’ cells; IPhC, inner phalangeal cell; GER, greater epithelial ridge which includes nonsensory epithelial cells present on the modiolar side of the epithelium; LER, lesser epithelial ridge, includes nonsensory epithelial cells present on strial edge of the sensory epithelium. Scale bar: B, 100 µm. 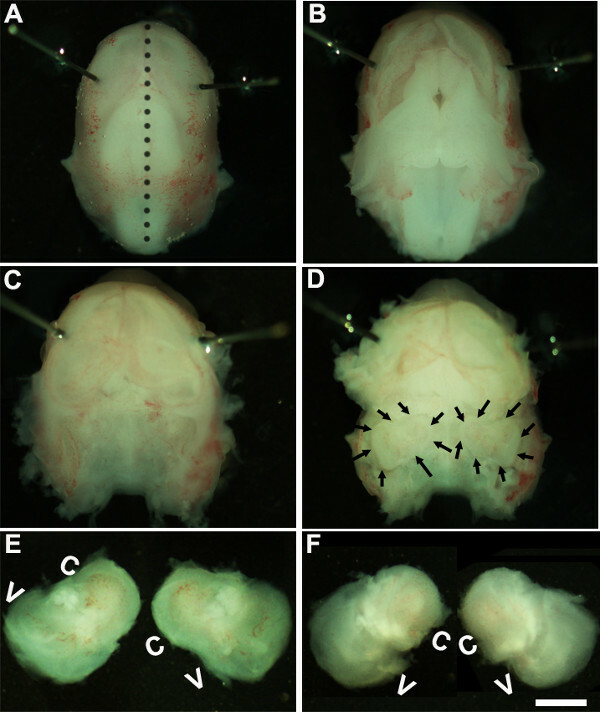 Figure 4: Electroporation of Atoh1.EGFP (A-C) and NeuroD1 into the organ of Corti explant culture. Embryonic (E) day 13 cochlear explants were established from WT CD1 mouse pups and electroporated with Atoh1.EGFP (A-C), NeuroD1-EGFP (D-F) reporter constructs as described and immunolabeled with hair cell-specific marker anti-Myo7a or neuronal marker, TuJ1 (β-tubulin III) in red. Electroporated cells which can be visualized by EGFP expression are seen throughout the GER, LER and sensory epithelium (SE) cells. The NeuroD1 transfected cochlear epithelial cells after 5 DIV acquire neuronal phenotype with dendritic processes, most of which are positive for TuJ1 while Atoh1 transfected cells are positive for Myo7a expression. SE, sensory epithelium; GER, greater epithelial ridge. Scale bar: A-C, 20 µm; D-F, 50 µm. Please click here to view a larger version of this figure. All the cells within the membranous labyrinth of the mouse inner ear including sensory, nonsensory and the spiral ganglion neurons are all derived from placodally-derived otocyst located adjacent to the hindbrain of the ectoderm, around E810-14. At E11, the ventral region of the otocyst extends to form the cochlear duct and as development continues, a group of epithelial cells within the cochlea, as well as in other regions of the otocyst, become specified as prosensory patches that will subsequently give rise to different types of mechanosensory hair cells and nonsensory supporting cells. In the developing cochlea, one row of inner hair cells and three rows of outer hair cells can be identified around E15.5 and by E17, patterning is essentially complete with single row of inner hair cells, pillar cells and three rows of outer hair cells. In a period of time that spans from E11 when the cochlear duct first starts to grow out through E17 all of the different cell fate decisions and patterning occur within the developing epithelium to generate a striking cellular pattern with a normal complement of hair cells and support cells. Loss of hair cells and/or support cells is the leading cause of hearing impairment. Since these cell types are generated only during a fairly compact time period during embryonic development, it is crucial to understand the molecular and genetic pathways that specify each of these cell types which should lead to significant insight into regenerative strategies. Cochlear culturing and electroporation techniques have been developed to manipulate gene expression in the developing mouse. In this video, we have demonstrated culturing techniques for generating primary explants and an electroporation technique for gene delivery into cultured embryonic murine organ of Corti. The primary explants prepared in this fashion can be maintained for 7-10 days in vitro. Cochlear explants can be used to manipulate gene expression by pharmacological approaches which will enable us to understand the mechanisms that regulate developmental processes such as fate specification, commitment, differentiation, and patterning. Moreover, this method facilitates the analysis of developmental phenotypes of mutant embryonic mice that do not survive past E12. The square wave electroporation-mediated gene transfer procedure provides a mechanism for manipulating gene expression in sensory hair cells, support cells, and cells within GER and LER regions in order to visualize their fate ex vivo. Using this procedure, we can downregulate or ectopically express specific genes in prosensory cells, hair cells and/or supporting cells in an otherwise wild-type background and analyze their specific effects on fate specification and differentiation. This will enable us to understand specific gene function within the developing cochlea. For example, as shown in Figure 4, the forced expression of Atoh12,4 or NeuroD18 in cells within GER or LER leads to the formation of ectopic hair cells and neurons respectively. In addition, this technique allows to electroporate multiple candidate genes6,7 and examine their effect on sensory hair cell and supporting cell formation, differentiation and their organization. The gene transfer technique involving adenoviral vectors offers broad expression and have been successfully used in the inner ear15,16. However, this technique depends on the skill to generate and purify the viruses which is often time-consuming. Although cochear cultures can be established as early as E12, electroporation of cochlear explants younger than E12.5/E13 will result in damage to the tissue making it cumbersome for analysis. In addition, the promoter of the expression vector used determines which cell types are transfected within the cochlear duct. For example, the human cytomegalovirus promoter containing expression vectors yields robust transfection in Kollikers’ organ, while use of CMV early enhancer/chicken beta actin promoter results in higher efficiency of transfection in cells within the sensory epithelium. The common problems encountered during the electroporation of embryonic cochlear explants are excessive cell death and/or damage of the tissue and poor transfection efficiency. The appropriate spacing of the electrodes and DNA concentration plays a crucial role in obtaining minimal damage and higher transfection efficiency. In summary, these techniques enhances our ability to manipulate gene expression via gain or loss of function strategies and pharmacological manipulations and greatly aid in dissecting signals that influence patterning and cell fate decisions. We would like to acknowledge Dr. Bradley Schulte for comments on this protocol. This work was supported by National Institutes of Health grant R00 (5R00DC010220). This project was performed in a renovated laboratory space supported by Grant C06RR014516. Sobkowicz, H. M., Bereman, B., Rose, J. E. Organotypic development of the organ of Corti in culture. J Neurocytol. 4, (5), 543-572 (1975). Zheng, J. L., Gao, W. Q. Overexpression of Math1 induces robust production of extra hair cells in postnatal rat inner ears. Nat Neurosci. 3, (6), 580-586 (2000). Zheng, J. L., Shou, J., Guillemot, F., Kageyama, R., Gao, W. Q. Hes1 is a negative regulator of inner ear hair cell differentiation. Development. 127, (21), 4551-4560 (2000). Woods, C., Montcouquiol, M., Kelley, M. W. Math1 regulates development of the sensory epithelium in the mammalian cochlea. Nat Neurosci. 7, (12), 1310-1318 (2004). Jones, J. M., Montcouquiol, M., Dabdoub, A., Woods, C., Kelley, M. W. Inhibitors of differentiation and DNA binding (Ids) regulate Math1 and hair cell formation during the development of the organ of Corti. J Neurosci. 26, (2), 550-558 (2006). Dabdoub, A., et al. Sox2 signaling in prosensory domain specification and subsequent hair cell differentiation in the developing cochlea. Proc. Natl. Acad. Sci. U.S.A. 105, (47), 18396-18401 (2008). Doetzlhofer, A., Basch, M. L., Ohyama, T., Gessler, M., Groves, A. K., Segil, N. Hey2 regulation by FGF provides a Notch-independent mechanism of maintaining pillar cell fate in the organ of Corti. Dev Cell. 16, (1), 58-69 (2009). Puligilla, C., Dabdoub, A., Brenowitz, S. D., Kelley, M. W. Sox2 induces neuronal formation in the developing cochlea. J Neurosci. 20, (2), 714-722 (2010). Kaufman, M. H. The Atlas of Mouse Development. Academic Press. San Diego. (1995). Sher, A. E. The embryonic and postnatal development of the inner ear of the mouse. Acta Otolaryngol Suppl. 285, 1-77 (1971). Torres, M., Giraldez, F. The development of the vertebrate inner ear. Mech Dev. 71, (1-2), 5-21 (1998). Brown, S. T., Martin, K., Groves, A. K. Molecular basis of inner ear induction. Curr Top Dev Biol. 57, 115-119 (2003). Puligilla, C., Kelley, M. W. Building the world’s best hearing aid; regulation of cell fate in the cochlea. Curr Opin Genet Dev. 19, (4), 368-373 (2009). Wu, D. K., Kelley, M. W. Molecular mechanisms of inner ear development. Cold Spring Harb Perspect Biol. 4, (8), a008409 (2012). Holt, J. R. Viral-mediated gene transfer to study the molecular physiology of the mammalian inner ear. Audiol Neurootol. 7, (3), 157-160 (2002). Stone, I. M., Lurie, D. I., Kelley, M. W., Poulsen, D. J. Adeno-associated virus-mediated gene transfer to hair cells and support cells of the murine cochlea. Mol Ther. 11, (6), 843-848 (2005).